Way back in 2014, Epson launched its first Runsense GPS-running watch and while GPS performance and unique features like its Stride Sensor definitely impressed, it had some big issues elsewhere. That underwhelming effort hasn't put off the company best known for its printers, and more recently its Moverio smartglasses, as it returns with five new GPS running watches. The new ProSense range includes watches that aim to cater for running newcomers and those who already put in the miles on a weekly basis. The ProSense 17 comes in at the cheapest at $99.99 with the ProSense 367 sitting up top at $399.99. Starting with the 17, which comes in black, light green and light pink shades, it offers built-in GPS with up to 13 hours battery life while tracking. The Garmin Forerunner 30, which is undeniably Garmin's budget running watch offers 8 hours of GPS battery life in comparison. Back to the ProSense 17 and it packs a 128x128 LCD display, but there's no touchscreen with five physical buttons to navigate. It does also feature a water resistant design (5ATM) so you can take it for a dip. In terms of running features, there's built-in training modes including interval training, support for heart rate chest straps and all of the data is synced to the revamped Epson View app (iOS and Android). There's also support for third party apps like Runkeeper and Strava so you don't have to leave your previous tracking behind. There's also all day activity tracking including sleep monitoring along with smartwatch features like notification support and music controls. Next up is the ProSense 57 ($149.99), which is available in black, green and red. It has the same LCD display and features as the 17 but that extra spend also gets you a wrist based heart rate monitor. GPS battery life does though drop to 10 hours if you're using both GPS and heart rate monitoring at the same time. The ProSense 307 knocks the price up to $249.99 and this is where we start to see the features for serious athletes. The 307 is available in black, white and blue models and sports a 240 x 240 EasyView display. The triathlon-friendly watch comes with interchangeable bands and will also track cycling and swimming. Battery life is up to 20 hours while the addition of a heart rate monitor unlocks additional training features like VO2max estimate, recovery time and training effect. That leaves the ProSense 347 ($349.99) and the 367 ($399.99) to round up the collection. The 347 offers the same multi sport tracking and heart rate monitor as the 307 and offers an impressive 46 hours of GPS battery life. It also packs a mineral glass lens to add another layer of durability. The 367 offers the same features including that mammoth battery life but adds a more luxurious sapphire glass lens along with an improved 10ATM waterproof rating. Of all the models, the 307 sounds the most impressive of the bunch, especially when you consider the price. You can't ignore those impressive battery performance claims either. 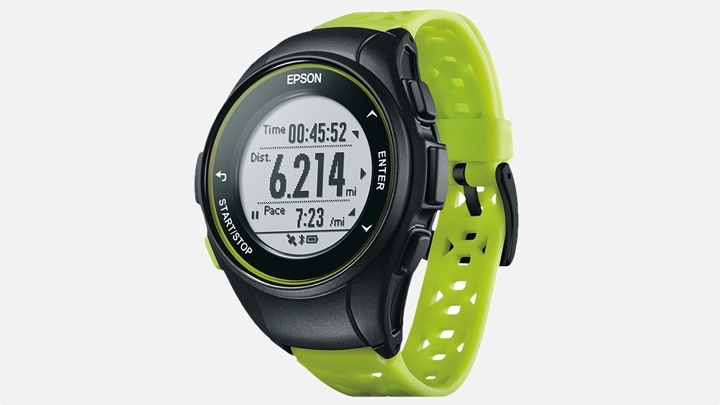 Hardware performance isn't something we doubted with Epson's first running watches though. The question is whether it has managed to make the watch UI less clunky and made serious improvements with both the app and the way data is handled. If Epson has managed to address those issues, then we could potentially be looking at a solid and affordable running watch alternative to what Garmin, Polar and Suunto currently offer up. All of the ProSense watches are available to buy now from the Epson website. We look forward to getting one or two in to see what they are made of.